Recently, I was asked to review the VTech 2-in-1 Shop & Cook Playset™. At first glance of the photo of the toy, I was concerned that the toy was a little young for Grace. Since we've been big fans of VTech toys since our nieces and nephews were little, I decided to give it a try anyway. Plus, Grace did fall right in the suggested 2-5 year old age range for the toy. The package arrived and the timing couldn't be any more perfect! We had a couple of rainy days and Grace was getting a bit of cabin fever. When she saw the box, she squealed! "Is that for me?!" I couldn't get the box open fast enough for her! I didn't even consider that the toy would need to be assembled before she could play with it and I was incredibly thankful that it snapped together very quickly and easily. In fact, it took longer for me to walk to our attached-garage to get batteries and a screw driver needed to open the battery compartment. I think Grace was very impressed that Mommy was able to put her new toy together too, otherwise she would have had to wait for Daddy to get home from work! I quickly gave her a demonstration of how the toy switches from shopping cart to kitchen and off she went to shop for, then prepare the pretend food! I couldn't have been more wrong in my first opinion about the toy being too young for Grace. 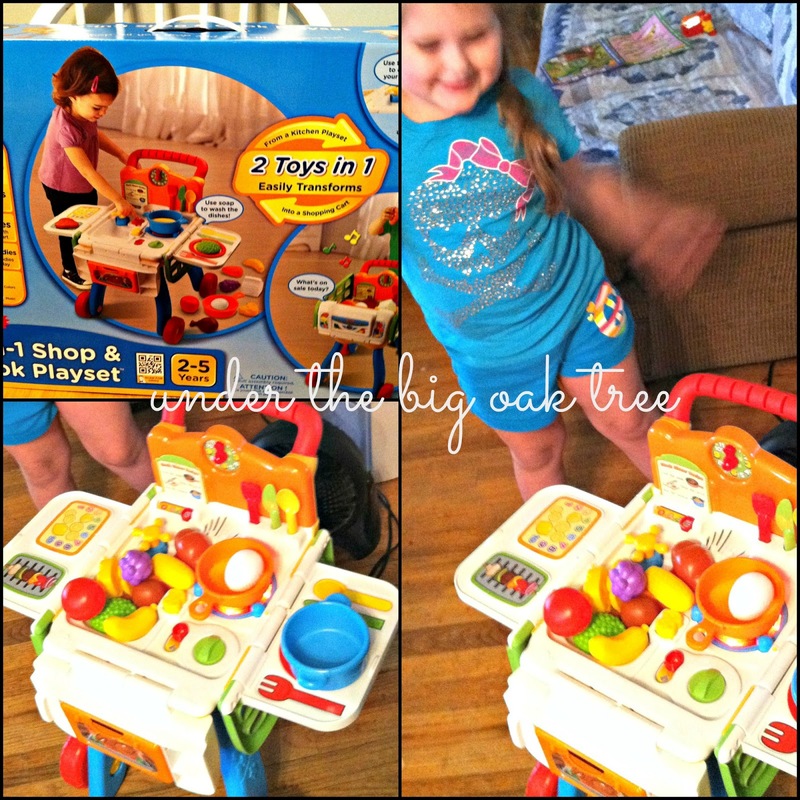 The VTech 2-in-1 Shop & Cook Playset™ kept my 4-year old busy for 2 whole days! During that time, she did not look at, play with or insist on sleeping with any other of her many, many toys! At our house, very often toys are picked out, brought home, taken out of the package and forgotten about in less than an hour! So the fact that she really played with this toy for that length of time is a really big deal! Since those first two days, she has started to play with some of her other toys in addition to the shopping cart/kitchen. But, as a sign of how special the VTech 2-in-1 Shop & Cook Playset™ is to her, she parks it beside her bed every night before she goes to sleep! We live in a small rancher without a playroom. Very often, toys are strewn from one end of the house to the other. While I try to keep them contained to just Grace's bedroom, I always seem to find them all over the house! I mean, all over! Even the kitchen and bathroom! So, the compact, 2-in-1 feature of the toy was a huge hit with me! Perfect for apartment dwellers or even at the grandparents' house! The volume control switch is awesome, too! Let's face it, while the kiddos will enjoy the 13 different melodies being able to choose the volume when taking an important phone call is very helpful. Another thing that I really liked about the playset was the accessories. The quality of the pretend food is incredible! So sturdy and durable! Not like the other pretend food that Grace has in her toybox! And Vtech really thought of everything and included a shopping list that doubles as a recipe when you flip it over (something that I didn't notice until Grace pointed it out to me)! · The 2-in-1 Shop & Cook Playset transforms from a shopping cart to a kitchen in a few simple steps. · The cart responds with fun phrases and sounds and when kids are ready to cook their meal, the cart becomes a play kitchen complete with a sink, oven, stove burner and cutting board. · The playset encourages pretend play and exploration while teaching about food, colors, numbers, music, following directions and more. · VTech has a full line of developmental stage-based infant and preschool learning toys that provide the appropriate tools for every age and stage of a child’s development. · With nearly 40 new product introductions in this category this year alone, VTech has one of the largest lines of infant and preschool electronic learning products, each one chock-full of play value for unlimited, open-ended fun. · From encouraging mobility and exploration among the youngest of infants, to introducing preschoolers to early learning skills, VTech’s line of infant and preschool toys introduces children to early learning skills and helps establish a lifetime love of learning. If you'd like information about how to order this product or to find other fabulous Vtech toys, visit their website! You can also find them on Facebook and Twitter! Would you like to win your very own VTech 2-in-1 Shop & Cook Playset™? 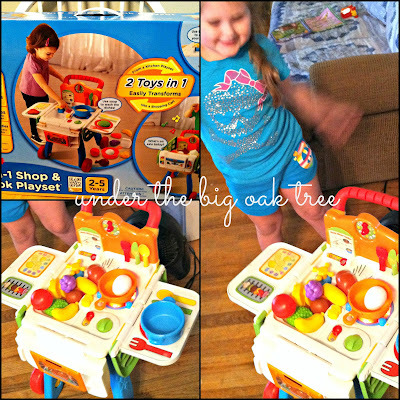 VTech was kind enough to provide not only a playset for me to review but an additional playset to giveaway to one lucky Under the Big Oak Tree reader! Awesome, right!? Entering is made easy with the rafflecopter form below! I like the InnoTab 3 for my daughter! I also like the Go! Go! Smart Wheels Car Carrier. Would love to try the Touch & Teach Word Book! My son would love to try the KidiBeats Drum Set. My son loves his Little Einsteins items made by V-tech! Would love the Kidizoom Camera for my son! I Like The Kidi Art Studio! My son loves to cook so I would love to win this shop and cook playset. I know my son would love the Switch and Go Dinos. I'd love to try the Innotab 3s and Switch N' Go Dino's as well! Oh I would also love to try the Count & Roll Tree! We would also like to try the innotab 3.
Who won these three giveaways? It Works! Greens Product Review and Giveaway!